Cabo All Inclusive Resort – Situated only ten minutes north of famed Cabo San Lucas, Pueblo Bonito Sunset Beach Golf & Spa Resort is truly a world of its own. Overlooking the rugged Pacific Ocean on a remote coastal bluff, this secluded and private setting is the perfect place for your ultimate vacation escape. Stunning architecture with gracious Old World detailing, personalized service and unmistakable Mexican hospitality will ensure your getaway is unforgettable. Pueblo Bonito offers the award-winning Armonia Spa, for the best pampering your body could ask for. Five incredible and diverse gourmet restaurants and numerous Aquabars throughout the property ensure your palate will be satisfied whatever hour your hunger strikes. Six incredible swimming pools give you lots of options for swimming, all with breath-taking vistas of the pounding Pacific below. Golf, other activities, and a host of family friendly services will make your stay at Pueblo Bonito Sunset Beach an unforgettable experience. Pueblo Bonito Sunset Resort features a premium unlimited luxury all inclusive concept that delivers an amazing vacation experience. From fine dining restaurants to room service and poolside drinks you will be in need of nothing. Pueblo Bonito Sunset Resort is unlimited luxury, which means you will only experience quality food, drinks and service. The FANCY Style is all about quality and exceeding expectation. From resort culture, architecture, food design, drinks and service you will experience only quality and amazing moments. You have access to a gorgeous beach with amazing sunsets, but you must know it is not a swimmable beach. This is for your own safety as the currents may be strong. This does not pose a threat to your enjoyment though, as there is plenty of pools and water activities. La Nao, The Bistro, Manila Bar, Lobby Bar, Villa 17 Aquabar & Grill, Villa 26 Aquabar & Grill, Villa 40 Aquabar & Grill, Main Pool Aquabar & Grill, Sky Pool Aquabar & Grill, Sunsets & Sushi (reservation required), La Frida (Reservation required, dress code, additional charges apply), Zao Shen Asian Kitchen (Reservation Required), and all themed parties (please see your concierge for the available parties during your stay). Unlimited Beverages selection: Non-alcoholic beverages, soft drinks and juices, coffee and tea, domestic cocktails and house wine selection, rum, tequila, whisky, brandy & cognac, house spirits, vodka, vermouth, beer and gin. Restaurants at Pueblo Bonito Rosé: Mare Nostrum, Pool & Beach Service, The Grill, Fellini’s (reservation & dress code required). Restaurants at Pueblo Bonito Los Cabos (Blanco): Las Palomas, Pool & Beach Service, Cilantro’s. Restaurants at Quivira Golf Club: Clubhouse, Steakhouse (reservations & dress code required, additional charges apply). 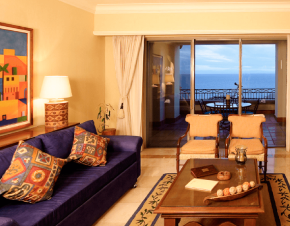 Our hotel junior suites offer over 538 square feet of luxurious living space. They include a private balcony or terrace, and living room area with sofa chairs. The sleeping area includes a choice of two double beds or one king size bed. Amenities include a fully equipped kitchenette, service-bar with coffee maker, large bathroom with shower, remote controlled tv with satellite reception, direct dial long distance telephone with voice mail service, ceiling fans and individual air conditioning controls, a private safe, hair dryer, and iron and ironing board. Minimum check-in age is 21. Over 1088 square feet, our hotel executive suites are one bedroom, two bath suite with either one king or two queen beds in the bedroom, a queen sofa bed in the living room, and a balcony or terrace. Amenities include a fully equipped kitchenette, service-bar with coffee maker, large bathroom with shower, second bath with tub-shower combo, remote controlled tv with satellite reception, direct dial long distance telephone with voice mail service, ceiling fans and individual air conditioning controls, a private safe, hair dryer, and iron and ironing board. Minimum check-in age is 21. Over 1800 square feet, our Super executive suites are one bedroom, two bath suite with Either one king or two queen beds in the bedroom, and a queen sofa bed in the living room. Amenities include a fully equipped kitchenette, service bar with coffee maker, large bathroom with shower, second bath with tub-shower combo, remote controlled TV with satellite reception, direct dial long distance telephone service with voice mail, ceiling fans and individually air conditioning controls, a private safe, hair dryer, and iron and ironing board. 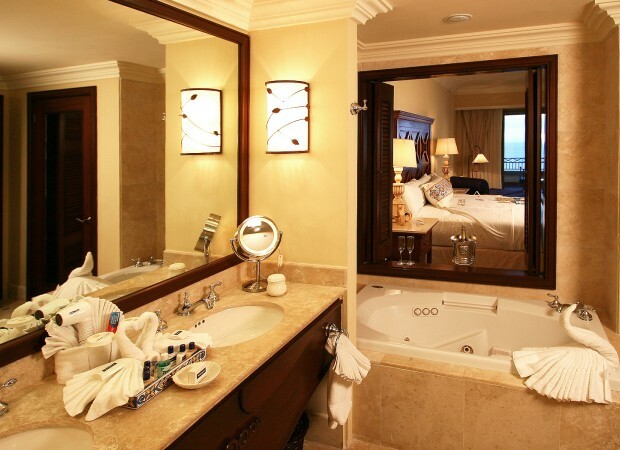 In Addition, the super executive suites feature a large Patio with personal Jacuzzi. Step into a world of unforgettable moments at Pueblo Bonito Sunset Beach Golf & Spa Resort. 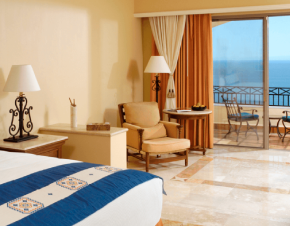 Overlooking the Pacific Ocean in sun-kissed Cabo San Lucas, family-friendly Pueblo Bonito Sunset Beach is an all-inclusive luxury resort blissfully secluded on a private coastal bluff. Our prime location offers both tranquil seclusion and convenient access to the vibrant downtown corridor of Cabo San Lucas, including prestigious golf courses and beaches. The delicious restaurants and bars offer extensive choices for your dining pleasure. Whether it’s a romantic candlelight dinner for two, a poolside snack, family dining, or a relaxed meal in the privacy of your suite, Pueblo Bonito Sunset Beach Golf & Spa Resort offers choices for every taste, any time of day. Embark on a journey of self-renewal and decadent relaxation at the award-winning Armonia Spa at Sunset Beach. You’ll feel immediately enveloped in an oasis of tranquility as your mind and body surrender to the healing touch of our certified spa therapists. The Armonia Spa at Sunset Beach offers an extensive menu of European-inspired body treatments and massage therapies, complete salon services, his and her locker rooms and wet areas, and signature Cabo San Lucas spa packages. The Armonia Spa at Sunset Beach was voted the #1 Top Hotel Spa in Mexico on the Travel + Leisure World’s Best List, and was also named among Top 10 Hotel Spas in Mexico, Central and South America by Travel + Leisure. Condé Nast named Sunset Beach’s Armonia spa as one of the Top 20 Best Spas in Mexico and Central America. Complimentary shuttle service between sister resorts, complimentary Wi-FI, onsite Parking Available, air-conditioned public areas, concierge desk, currency exchange, dry cleaning/laundry service, luggage storage, medical assistance available, multilingual staff, wedding services and more. Created as an exclusive amenity for guests of the Quivira community and Pueblo Bonito Oceanfront Resorts and Spas, this world-class layout offers dazzling views and breathtaking drops from tee to fairway. In a destination revered for its unique ocean-desert-mountain setting, Quivira offers more oceanfront exposure than any other course in Los Cabos, with panoramic views of the Pacific from every hole. Guest can enjoy All Inclusive privileges with 14 different dining options plus daily theme parties, and 12 different bar options (including the bars and restaurants of Pueblo Bonito Rosé Resort & Spa and Pueblo Bonito Los Cabos) ) regular shuttle service connects you to all the restaurants and bars at the neighboring Pueblo Bonito Resorts. LuxLife Vacations not only provides the best available online rates, but your talented and connected personal concierge actually curates and customizes your vacation just for you. The Luxlife Concierge service is complimentary and will ensure you are in the know, with the best of Cabo, while saving you time and money. There are no booking fees with LuxLife Vacations, and we provide a FREE CANCELLATION POLICY prior to standard resort policies taking effect. We understand that unanticipated events happen occasionally in everyone’s life. Business meetings, project deadlines, flight delays, car problems, snowstorms, and illness are just a few reasons why one might consider cancelling their vacation. In our desire to be effective and fair to all, and out of consideration for our guests’ time, we offer our guests free cancellation. However, we must honor policies in accordance with each resort’s stipulated cancellation policy . If cancelled within the time period there is a 1 night penalty. If cancelled within the time period during holiday (premium Season) the guest will forgo the entire stay. The Fiesta Americana Grand Los Cabos Golf & Spa is ranked #9 on Golf Digest Magazine’s list of the “Top 50 Best Golf Hotels in the World.